On the 20th June 2018, the Exeter Central Asian Studies network were delighted to be joined by Muhiddin Kabiri at the “Political Exiles and Transnational Repression in Central Asia and Beyond” workshop. Held at Chatham House, and formed as a cooperative between ExCAS, Chatham House and the European Social and Economic Research Council, the morning event sought to bring together world leaders from several academic and NGO bodies, to discuss the extent of political repression on a transnational scale, emanating from Central Asia. Kabiri, leader of the banned Islamic Renaissance Party of Tajikistan (IRPT) and a political exile from Tajikistan, spoke via Skype link, providing a vivid account of political repression in the nation, both internally and extra-territorially. He also concluded his talk with a note of hope for the future of the political relationship between the state and religion in Tajikistan, despite the hardships that have been faced in the past. Following the 2015 election in Tajikistan, the IRPT received a woeful 1.5 percent of the official vote, despite being the second largest party in the country, and was excluded from parliament for the first time since the party has joined the country’s peace process as part of the political opposition. Kabiri left the country just after the elections, for what he hoped would be no longer than a month’s visit. Yet things did not turn as he hoped. Very quickly, the Tajik state began to increase its crackdown on political Islam in the nation, by attacking leaders of the IRPT party. In August 2015, the Tajik government formally banned the IRPT, going on to declare it as an ‘extremist group’. Following these events, Kabiri has been unable to return to Tajikistan, due to the threat of imprisonment and violence he faces upon return. In 2015, Tajikistan’s political landscape worsened dramatically with the forced closure of the IRTP party and crackdown on civil society, journalists or any form of opposition party and individuals deemed to present a threat to President Rahmon’s regime. As the Central Asia Political Exiles Database demonstrates, many Tajik opposition figures continue to face repression beyond their country’s border while in exile. Increasingly the government is extending its authoritarian ruling by targeting its perceived critics abroad and seeking their return to Tajikistan. As Amnesty International’s Maisy Weicherding detailed, the government further punishes the relatives of individuals leaving in political exiles via defamation campaigns, detentions, abuse while in detention, the dispossession of assets, and the withholding of medical treatment. As Kabiri explained, transnational repression by the Tajik state continues to be a part of his day-to-day life and that of his colleagues. During his speech at Chatham House, Kabiri detailed how a member of the Tajik security services had followed him to Europe, brazenly sitting with him on the same train and openly surveilling his target. Further to this, the Tajik security forces continue to disrupt and intimidate his family members in Tajikistan. Most recently, the authorities prevented his three-year-old grandson from receiving the necessary paper work that will allow him to travel abroad for life saving cancer treatment. According to Kabiri, the use of repression by the Tajik state has overtaken the methods used by traditional authoritarian regimes, legitimated by the war on Islamic terror. Despite this situation Kabiri remains resilient. Recently he was awarded refugee status in an EU country. Further to this, in 2018 he was removed from the INTERPOL ‘Red Notice’ list. The issuing of ‘Red Notices’ via INTERPOL to facilitate the extradition of political exiles has long been a tool used by Central Asian security services. The removal of Kabiri from the INTERPOL list, therefore represents a positive step towards tackling extra-territorial repression used by Central Asian states. In his closing remarks at Chatham House, Kabiri stated once again his long-standing hope that positive change can be brought about in Tajikistan, through cooperation between civil societies organizations, academics, and international policy makers to tackle abuse and repression in Tajikistan. RFE/RL (2015). Tajik Islamic Party Banned. [online] RadioFreeEurope/RadioLiberty. Available at: https://www.rferl.org/a/tajik-islamic-party-banned/27213877.html [Accessed 2 Jul. 2018]. See also: Pikulicka-Wilczewska, A. (2017). 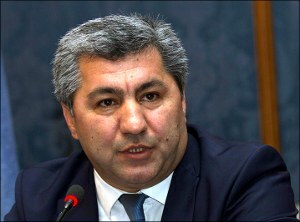 Exiled Tajik Opposition Leader Speaks. [online] The Diplomat. Available at: https://thediplomat.com/2017/05/exiled-tajik-opposition-leader-speaks [Accessed 2 Jul. 2018]. RFE/RL (2015). Tajik Islamic Party Banned. [online] RadioFreeEurope/RadioLiberty. Available at: https://www.rferl.org/a/tajik-islamic-party-banned/27213877.html. [Accessed 2 Jul. 2018]. Eurasianet (2018). Tajikistan: Grandson of Opposition Leader Denied Medical Treatment. [online] Eurasianet.org. Available at: https://eurasianet.org/s/tajikistan-grandson-of-opposition-leader-denied-medical-treatment. [Accessed 2 Jul. 2018]. Pikulicka-Wilczewska, A. (2017). Exiled Tajik Opposition Leader Speaks. [online] The Diplomat. Available at: https://thediplomat.com/2017/05/exiled-tajik-opposition-leader-speaks/. [Accessed 2 Jul. 2018]. Pannier, B. (2018). Rare Triumph For Tajikistan’s Embattled IRPT. [online] RadioFreeEurope/RadioLiberty. Available at: https://www.rferl.org/a/tajikistan-islamic-renaissance-party-leader-kabiri-interpol/29076658.html. [Accessed 2 Jul. 2018].